Norwegian author GunnarStaalesen just entered his seventies, and his crime novels date back to when he was 22. Still, he’s not well known in the US because of the lag in translation. Fortunately, for his best-selling series featuring Bergen private investigator Varg Veum, that’s changing. BIG SISTER (originally published in 2016) is the sixth in this series that Don Bartlett has translated, with an easy-to-enjoy casual feel to the writing, and just enough “foreignness” on the tongue to appreciate the Scandinavian backdrop. 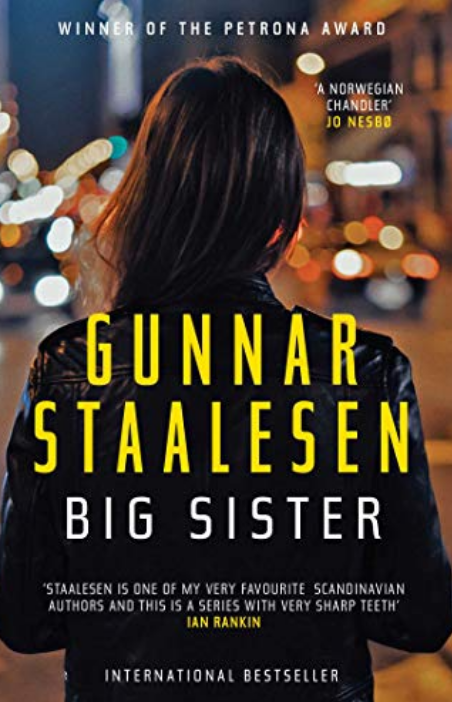 Big Sister is not a standard Nordic noir—Varg Veum’s darkest years are done, and he’s settled happily into a long-term relationship with stable lady friend, and a caring if somewhat distant one with his son. He’s not hitting the bottle or any other form of mind-numbing substance. But the opening of the book proves he still has secrets in his own past, or more precisely that of his family, to cope with: The woman arriving at his office, Norma Johanne Bakkevik, introduces herself as the elderly half-sister he’s never met (she was adopted long before his birth), and wants to be his client in the disappearance of a college student. Veum’s baffled by the presentation of the case: Nineteen-year-old Emma Hagland, a good student and quiet person, and Norma’s goddaughter, walked out of the apartment she shared with two other young women, and simply vanished. Nobody’s heard from her since. And the police, understandably, decline to take action, since college students are all too likely to move in with boyfriends, relocate due to quarrels, quit school and go on extended vacations, you name it. Varg’s inclined to that opinion at first, too. But there are a lot of missing or damaged parents in this set-up, including young Emma’s estranged dad, who turns out to be part of a not very pleasant motorcycle club closer to Varg’s own locale. He can’t help noticing the pattern of upheaval and hurt as he investigates (he’s a PI with pretty good police connections). Most disturbing of all is Veum’s visit to a woman named simply Veslemøy—no surname in use—who’s grown up well cared for in a mental institution and remains almost catatonic, and certainly speechless. This condition followed a long-ago sexual assault on Veslemøy—an assault blamed on the missing teen’s long-gone father, who still associates with a pair of brutal men from those years, leaders of the dangerous motorcycle club. I stared into space. I still didn’t have a distinct picture of Emma, but it was beginning to resemble a kind of profile, a bit blurred at the edges, but clear enough for me to see a vulnerable young woman, someone it might be easy to lead astray, someone who was open to approaches, whether well meant or malevolent, someone who could easily become a victim. This worried me and created a sense of urgency. Perhaps I would have to resort to a few short-cuts, however brutal they might seem to outsiders—or to those concerned. Veum’s short-cuts take him into confronting a brutality that threatens his life, repeatedly, but that’s not a new experience. Staalesen solves those moments with some “deus ex machina” moves that detract from the emotional power of Veum’s hunt for Emma and his dark plunge into the deadly side of social media. But this minor flaw doesn’t stop the force of the book, and the search for both Veum’s truth and Emma’s makes a fiercely good crime novel, with an unexpected but satisfying final twist. 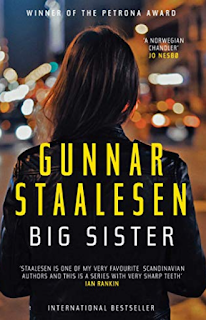 Despite the Norwegian PI slant, BIG SISTER is far from the darkness of Henning Mankell or Karin Fossom. Consider it a traditional sleuth mystery, with plenty of nontraditional options added. Well worth reading, with the rest of Staalesen’s award-winning series.